Justice! 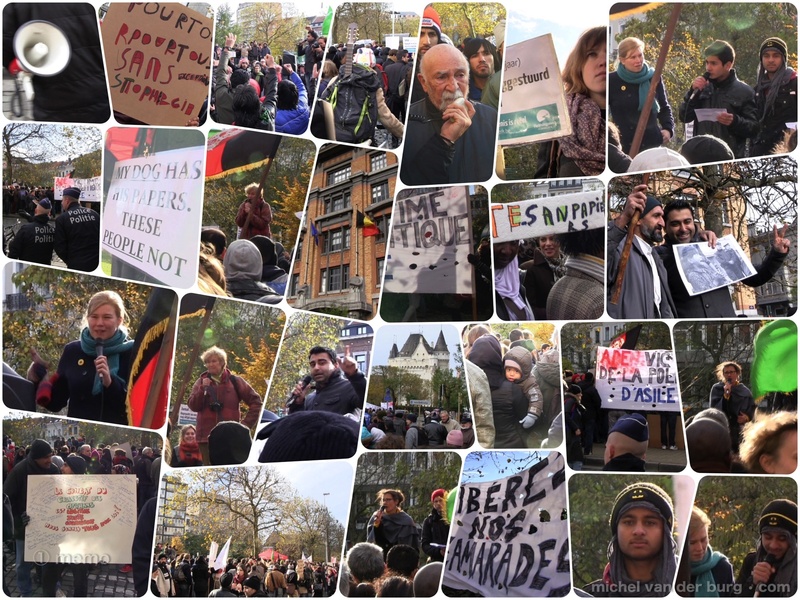 Very successful solidarity march by Belgians and Afghans for the Afghan refugees in Brussels , today 2 years ago (20 nov 2013). Many are now regularized. One of these refugees I know – Kamran – recently got visa for his wife and kids to come to Belgium. He started just days ago a fresh start for his family in Belgium .. and a gofundme campaign for some help for his family — while he himself is helping tonight newcomers in the rainy streets of Brussels. Background (together with my NY partner Kristen Cattell) in the Beguinage church in Brussels. This entry was posted in doc, english, memo, photo, post, street and tagged afghan, beguinage, belgium, brussels, refugee, Refugee Status on 20151120 by michelvanderburg. In March 2014 I traveled to Brussels, Belgium to meet a group of Afghans living inside an old Catholic church. At the time, nearly one hundred Afghan refugees had set up camp within the walls of the seventeenth century compound. There were camping tents and make-shift walls within the Baroque interior. Respectfully abiding by the teachings of Islam, the main religious practice of the Afghans living in the Catholic church, there was one side for woman and children and one side for males. Their shoes were piled up outside of the doors of their tents and warm pots of chai were passed around during mealtime. On a sunny afternoon dozens joined in on a game of cricket, cautious to not start a scene or cause too much noise. All they could do at this point was wait for a potential interview date and hope to receive legal status in a country that they could only half-heartedly call home. A majority of the males I spoke with were well-educated; most speaking French, Dutch, and English in addition to their native Afghan language of Dari or Pashto. Their skills and experiences as translators, guards, and service men in Afghanistan had threatened their livelihood and ultimately forced them to flee their homeland. The priest of the church, Daniel Alliet, opened the space to the Afghan refugees because he disagreed with Belgium’s asylum policy. At present, the situation continues to evolve: the church is now used as an Afghan community center instead of a shelter, some have been granted alternative housing accommodations throughout the country, and many refugees were granted the right to stay in the country legally. In Brussels, and around the world, Afghans are facing the harsh realities of displacement while others are struggling to resettle without official resident status, nevertheless, their strength is what binds them and they tirelessly continue to fight for justice. Special thanks to Isabelle Marchal and the many friends that welcomed us , and also others whose works were on display at the church and are shown in these pictures. * Update Sept 6th 2015 – Our full report first appeared May 28th, 2014 (via the now no longer existing web site “Rising Afghans”) and is now fully included here. Belgians and Afghans demand justice – Video report by Michel van der Burg. Belgians and Afghan refugees demand Belgium changes its asylum policy. This entry was posted in doc, english, photo, post, street and tagged afghan, artist JR, asylum, beguinage, Borderless, brussels, church, Daniël Alliët, Inside Out, InsideOut, organ, photography, refugee, Rising Afghans, Salon Mommen, Sans frontières, sans papier, undocumented, Zonder grenzen on 20140529 by michelvanderburg.